A fantastic year - a fantastic team. All State Team : A few CCS runners (Gotcher, Chaves & Graham) make the All-State Team. All NorCal Team : After 20+ years of an absence, the All NorCal XC Team selection has been reinstated. FootLocker-Nationals : The West wins both the Boys & Girls. 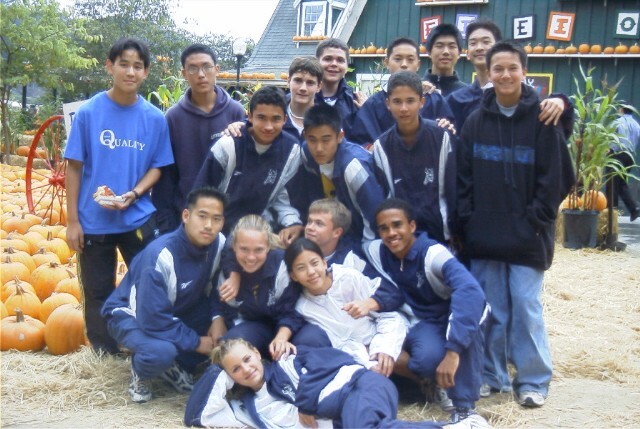 FootLocker-West : Everyone PRs on this tough MSAC course. Members Stephanie & Matt Claussen, Tak Fujita, Hank Lawson, Francine Lee & Jeff Whitsett have a blast. CCS Honor Coach : Lynbrook Coach Hank gets the award for Boys XC. All CCS Team : The votes are in and the results are posted - check it out. Emil Zatopek : Long time distance great dies at the age of 78. At-Large Teams : At-Large Teams are announced for State Meet. All CCS Nominations : Sasoon Kim is nominated for 2nd Team All CCS Frosh girls. At-Large Teams : Southern Section qualifies 37 additional teams with At-Large times. At-Large Teams : Looks like States may be very crowded this year with the SS potentially bringing another 30+ teams that reach the At-Large time - and they're just 1 of 10 sections! CCS Finals : Sasoon Kim PR's by another 50 seconds running 20:46 for 39th place. Francine Lee finishes 58th with a 21:38 clocking and Jeff Whitsett PR's by 2 seconds with a 16:47 time while taking 28th place. CCS Estimates : Where does Walt VanZant get all the data (and time) to come up with such detailed estimates? Check 'em out. At-Large Times : The At-Large Times are in and confirmed. At-Large : Coaches - More info on the At-Large qualifying standards. DAL Finals : F/S Boys, lead by a 1-2 finish of Deal & Berson, come home with a Team Championship. JV Boys garner a 3rd place finish with Casey Courtney taking the helm. Varsity Girls finish 5th, a mere 3 points out of 3rd. JV Girls take 5th and Varsity Boys finish 6th. Both Jeff Whitsett and Francine Lee qualify for CCS. Lynbrook Invitational : Wow, now this was a WET one! JV Boys came thru with the win with Meyer (6th), Katz (7th), Choi (8th ), Chung (9th) & Courtney (11th) over Wilcox. Varsity Girls placed 2nd with Lee (3rd), Kim H (4th), Kim S (7th), Ignaitis (15th) & Bossange (21st) behind Monta Vista. Varsity Boys took 3rd with Whitsett (5th), Deal C (9th), Berson (15th), Kuwahara (17th) & Deal R (24th) behind Wilcox & Saratoga. JV Girls finish 4th with Gall (10th), Hung (11th), Ju (12th), Qureshi (19th) & Perng (21st). Coaches : Please read this dilemma about the At-Large qualifying standards for State (what should we do?). CCS Finals will be held at Crystal Springs on Nov 11th. State Rankings are now available. St Francis Invite : Frosh Boys really shine by winning this one over Fremont. Scorers Chris Deal (2nd), Eugene Berson (4th), Allen Chang (17th), Jason Whitsett (20th) and Morgan Katz (36th) lead the Vikings to the victory. Other Freshman included Charles Chen (41st), Hsiang Hsiao (43rd), Warren Lou (53rd), Michael Olson (61st), Matt Claussen (71st) and Siva Kandasamy (74th). Serra Invitational : Jeff Whitsett PR's by another 17 seconds, Berson by 18 seconds and Jason Whitsett misses by 4 seconds. Crystal Springs #1 : JV Boys have a hey-day taking 1, 2, 5, 7 & 14 for the win. JV Girls finish 2nd with a 3, 9, 11, 12 & 14 place finishers. Whitsett & Lee again lead the Vikes. Artichoke Invitational : Jeff Whitsett (31st), Eugene Berson (22nd), Francine Lee (10th), Sasoon Kim (16th) & Kate Bossange (22nd) all earn medals at this Invitational. The F/S Girls come away with a 4th place team finish - and everyone enjoys the Pumpkin Patch afterwards. CCS Declarations : And the Divisions are in. To see who is in which division, click on the link. Stanford Invitational : Running with the Big Boys! Jeff Whitsett has the best showing while placing 118th. Ken Chung has his best race of the year while beating Ryan Deal and finishing 3rd man for the Vikings. Francine Lee continues to lead the ladies while placing 131st. CCS Declarations : Coaches-If you plan on moving up a division, you need to do so by 9/30 (Sat), so do it by this Friday. Central Park : A sprint to the finish ends up with a 2nd place for Chris Deal while the F/S Boys team of Eugene Berson (6th), Chad Smith (10th), Morgan Katz (35th) and Jason Whitsett (38th) finish 3rd overall. Other medal winners are Sasoon Kim (8th), Evan Smith (12th), Jeff Whitsett (18th), Kevin Perng (5th), Casey Courtney (16th) and Francine Lee (24th). CCS Rankings (9/25) : Lynbrook Girls XC team are ranked 14th. State Advisory Committee : The State Advisory Committee for XC & Track met on Sept 19th and here are the minutes to that meeting. Lots on XC and the At-Large berths. Track will stay as a single division Championship meet. Saratoga Invite : JV Boys are the top news at this meet with Matt Meyer winning the race and the boys finishing 1st in the team race with Ken Chung (4th), Jonathan Choi (5th), Casey Courtney (12th) and Chris Lum (13th). Jeff Whitsett (18th) continues to pace the Varsity Boys (5th) with Frosh Chris Deal (20th) being close behind. Francine Lee (9th) let the ladies to a 3rd place finish - 1 point behind Saratoga. Lynbrook SPIRIT is great - thanks for the lolipops. Firebird Invite : Deal, Smith & Berson all get in Top 15 for hardware and lead the F/S Boys to a 2nd place team finish. Whitsett continues to set the pace with a 22nd place finish. Lee bounces back with a 19th place to lead the ladies and Kuwahara surprizes all by just missing a win in the JV Boys race. Balloting : Coaches, if you want your input to count on the Mercury News Top 15 Ranking, then send your 'picks' to Terry Ward. Logan Center Meet : Jeff Whitsett & Cris Deal continue to lead the Varsity & Frosh/Soph Boys squad (with 4th & 3rd place team finishes). Patrick Goodman leads JV Boys to a 3rd place team finish and Sasoon Kim lead the Lady Vikes. 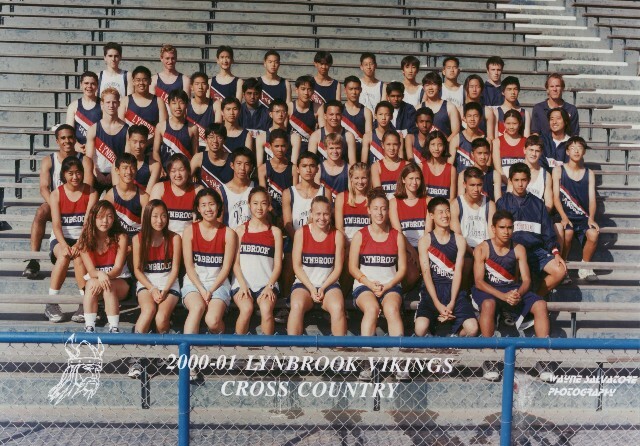 CCS Minutes : The minutes of the Pre-XC meeting for CCS can be found here. CBED : The CBED numbers and school divisions are in (pending approval). Lynbrook Center Meet : Chad Smith and Chris Deal win the JVB and F/S Boys race. Jeff Whitsett and Francine Lee top the VB and VG races for Lynbrook. Parents Meeting : We had about 25 parents at the meeting - my best turn out to date. Thank you all for taking the time out of your evening. XC Starts : First week of practice starts with 12 showing the first day and over 30 by weeks end - a Great start!